With temperatures at record lows and snow drifts and snow mounds piled high, Montanans have had it up to here with one of the more intense winter seasons in the state’s history. In Billings, for example, temperatures this winter have averaged 22.5 degrees Fahrenheit, according to the National Weather Service. That’s the 13th coldest average ever for the city and more than 5 degrees below what’s typical. But it’s the snowfall that’s really turned heads. In Billings, roughly 65 inches have fallen on Magic City through February, according to the NWS. That’s more than three feet above what’s the norm for Billings over the three-month period and the third highest total of all time for Montana’s most-populous city. All that snow – much of which remains due to bone-chilling cold – has made road conditions treacherous, resulting in spin-outs and defensive motorists slowing their rate of speed. But the foul weather fallout has been particularly harsh on people’s homes, evidenced by a phenomenon known as ice jams. Although not unusual, the residential property version of ice jams (they also affect rivers) develop as a result of the freeze-thaw process that late winter is known for. Here’s how they work: When snow accumulates on your roof, it slowly but surely melts when temperatures rise, combined with the interior warmth of the home. It’s at the ridge of the roof – where the eaves are – that the problem arises. Because the edge isn’t as sensitive to warming temperature changes, ice ridges form, blocking melting snow from draining off to the ground below. All that water has to go somewhere, and that somewhere may be the interior of your home, affecting its walls, ceilings and insulation. Remington Brown, senior engineering director at IBHS, said that thin layers of ice forming on the roof is harmless, but not when it happens repeatedly. Many homeowners in Montana have become all too familiar with this winter weather hazard. This may be because river-related ice jams are notorious in Big Sky Country. According to the National Oceanic and Atmospheric Administration, Montana tops every other continental state in ice jamming frequency. And historically, 66 percent of ice jams take shape in the months of February and March. These are the same months that ice jams on roofs frequently develop, perhaps because the freeze-thaw cycle is so common compared to January, when the weather is typically colder. Removing snow from the roof reduces ice jam risk. Ice jams can’t develop if they have nothing to work with. 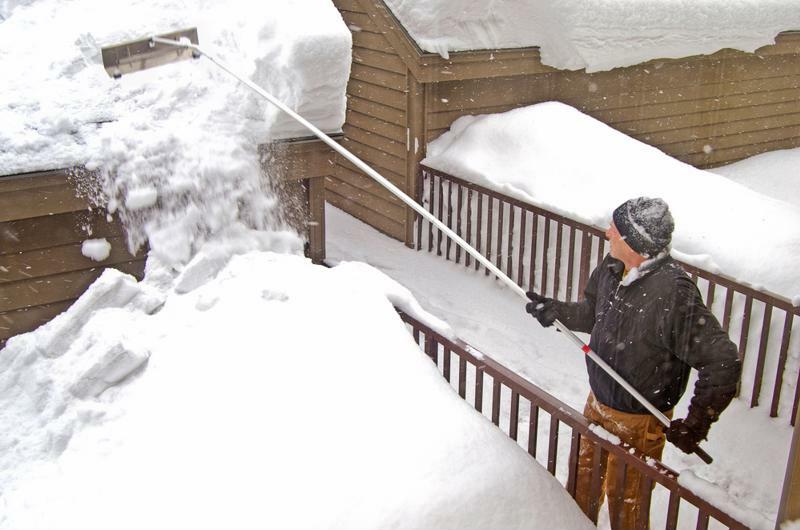 Thus, when snow starts to pile up, grab a roof rake to remove what’s aloft. As for how much is too much, it depends on the size of your roof. You may want to err on the side of caution and rake whenever there’s a noticeable accumulation. IBHS recommends using a snow rake with wheels so you can remove it from the ground, thereby avoiding the risk of a potential slip-and-fall injury. Brian Daubert, personal lines sales director at PayneWest, indicated preparatory maintenance is in order as well. As the old saying goes, an ounce of prevention is worth a pound of cure. By using high-quality heating cables on downspouts, gutters and eaves, snow packs should drain more cleanly, especially when said roofs run flat or have a flatter pitch than traditional roof surfaces. IBHS warns that while upper echelon heating cables – such as those that are UL Listed or certified by CSA International – won’t completely eliminate the risk of ice damming, they should make them less likely or at the very least not as damaging. Daubert added the best performing roofs are those that are properly constructed and regularly maintained. 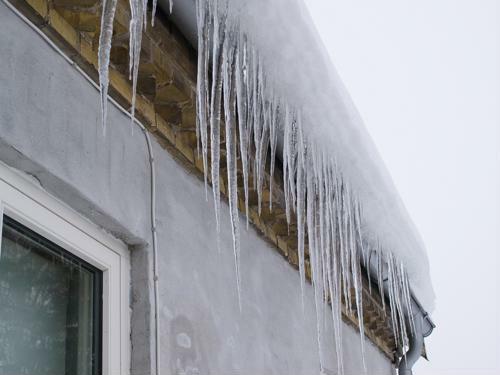 Otherwise, ice buildup can lead to more substantial problems that are harder to fix that may compromise other structures attached to the residence. What’s the airflow like in the attic? If ventilation is poor, there’s a greater risk for damming. Guard against this by sealing any openings and adding insulation to the attic. If you’re unsure of how to do this or how much is the proper amount, a trained professional can help. Talk to your PayneWest Insurance professional for more tips on keeping your property safe as winter 2018 enters the home stretch.